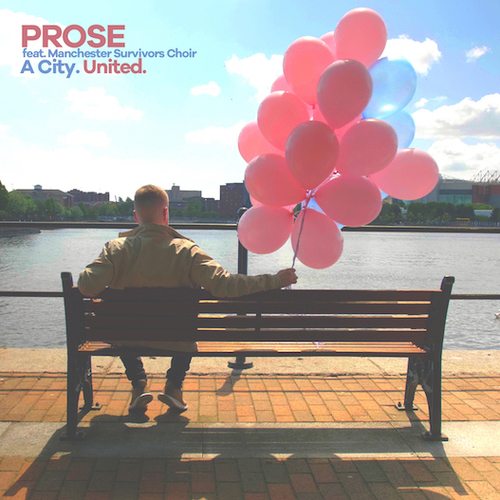 Prose (featuring Manchester Survivors Choir) - A City United. • Prose and Manchester Survivors Choir will perform the song on the main stage at the Parklife Festival on Saturday 9 June. The Manchester band, Prose and Manchester Survivors Choir (a choir made up of parents and children who were caught up in the Manchester Arena bomb attack) have teamed up to raise money for the those affected by the Manchester Arena bomb. "Like everyone, we felt devastated after the Manchester bomb attack. The following day we were in our studio and there were still a lot of people searching for missing family members and we were talking about how awful it must be for the families of the victims. The whole city was in complete shock that something like this had happened here and at a music concert with so many innocent people just trying to have a good time. We both felt very emotional and just started expressing how we felt. Lee started playing the piano, I started singing and without realising it we had the basis of a song, but we didn't know what to do with it!" Prose played the tune to friends and family, who all loved it, so they decided to make a live video just for their fans on their Facebook page only. "I first heard Prose perform this song in Piccadilly Gardens last year. It cut straight through the noise of the city and stopped me in my tracks. It captures exactly how we all felt last year when we heard the terrible news, but also how the character of this place pulled us through. It is the very spirit of Manchester in music." Andy approached Prose to see if they would be up for releasing A City United with the proceeds going to Manchester Emergency Fund and Peace Foundation. Lee and Mike said they'd be honoured, but only if they could ensure that the families and people involved were happy with them doing this. In fact, all the families are behind the project and have endorsed it completely. Saffie Rousso was the youngest victim out of the 22 people killed that day. Her father, Andrew posted this message on Prose's Facebook page: "Heartfelt song from a great city." “When we saw Andy Burnham's tweet about the single, we knew we had to get in touch with Prose. We loved the song, the lyrics and everything it stood for and really hoped we could be part of it. They were singing about us, so it just felt right. Buy A City United here. Prose and Manchester Survivors Choir were guests on Afternoon Edition, BBC 5 Live. Featured track on Record Of The Day. Appeared on ITV News marking one year since Arena attack. Prose band members: Mike Murray, Lee Royle and Dave Stone. Prose were discovered by producer Naughty Boy. Prose have worked with Naughty Boy and Emeli Sande. Prose debut album Home of the Brave was released by Virgin Records in 2016. This press release was distributed by ResponseSource Press Release Wire on behalf of AskMe PR in the following categories: Children & Teenagers, Men's Interest, Entertainment & Arts, Women's Interest & Beauty, Public Sector, Third Sector & Legal, for more information visit https://pressreleasewire.responsesource.com/about.